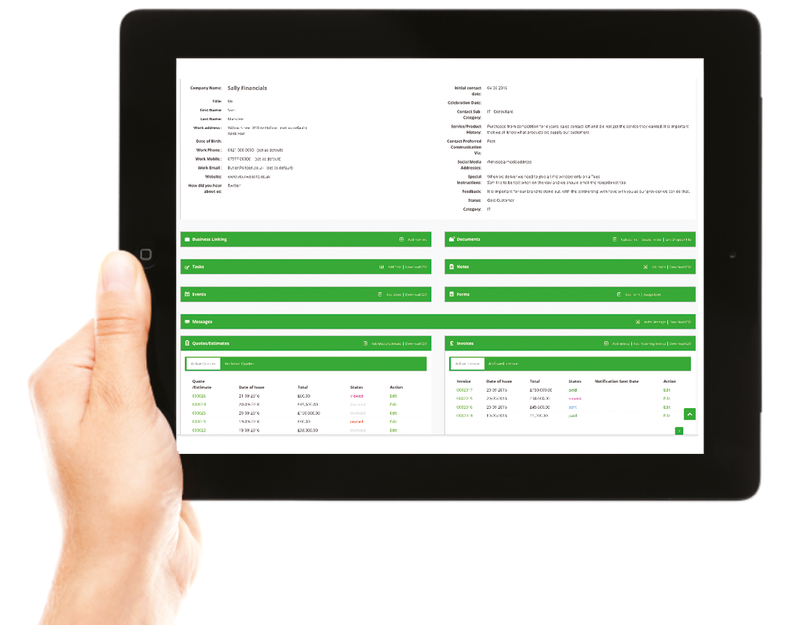 With 4CRM, your Quote System is integrated directly into your CRM Platform. You can send your branded quotes and track when they are viewed and accepted. With 4CRM, your Quote System is integrated directly into your CRM platform. You can create the email template for your branded quote and then use this template to send out your quotes/ estimates from your 4CRM email platform. As with creating invoices, the customer details are already stored in your Business and Contact Dashboards, so you do not need to duplicate this information. Your customer will receive the quote in the form of an email, so they can comment on or request changes to the quote as required, speeding up the quotation process. You can send your branded quotes and track when they are viewed and accepted. You can also give your customer the facility to ask questions about the quote and let them see your response instantly. 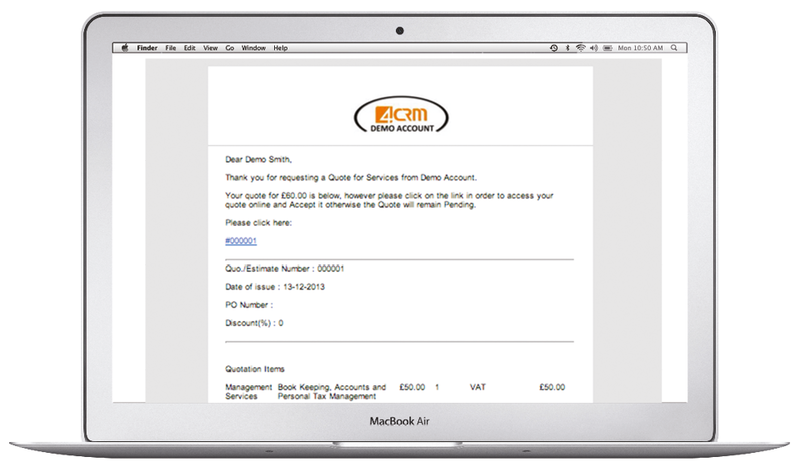 Once your customer has accepted the quote you can simply select the convert to invoice button. It’s simple to generate a quote in 4CRM as all your customer details are already there. You can add to, or amend this at any time. You can create a bespoke Quote Template for each customer. Branded with your logo so any member of your team can send out a quote that will be a consistent format. 4CRM will automatically email a fully branded pdf of your quote directly into your customers’ inbox. You can add attachments and add notes to the quote that is specific to that customer. Once 4CRM has emailed your quote you can instantly track it’s progress; when it’s been read through to when it’s accepted. 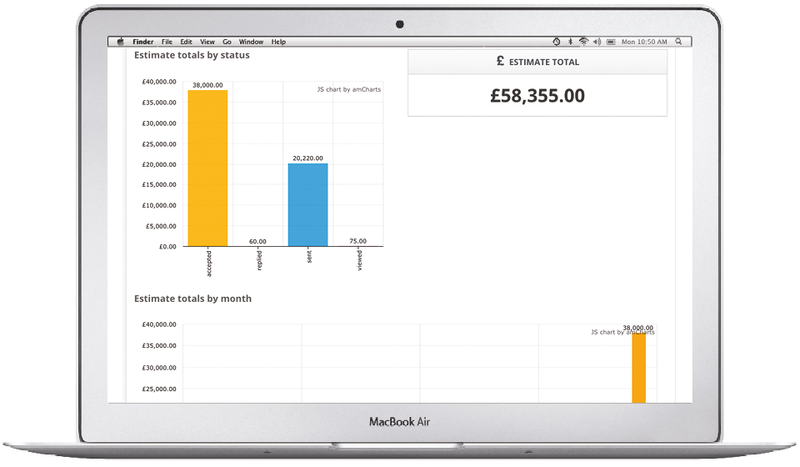 This gives you perfect visibility of your quote conversion rates helping to maximise sales.